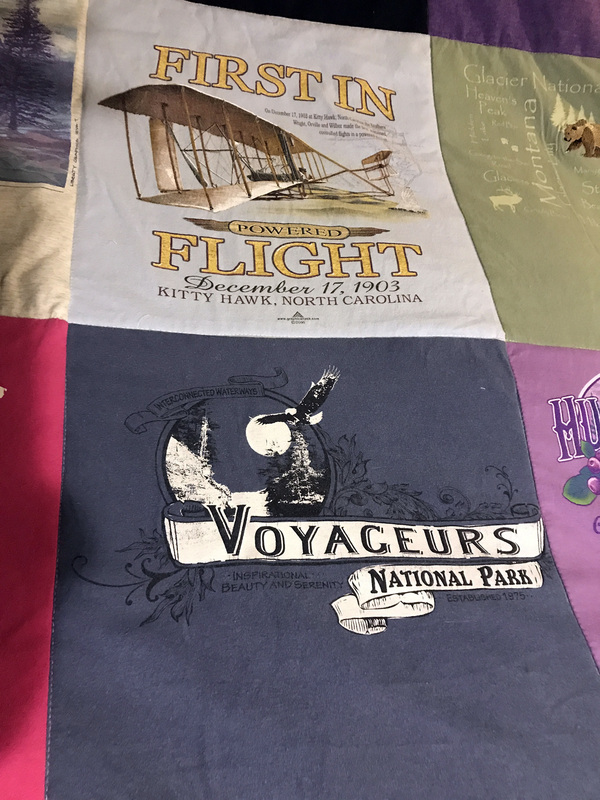 When we originally went on the road, I had an idea that I wanted to make a travel quilt out of T-Shirts I collected (I stole the idea from one of the Twilight movies), but after talking to my friends Sue and Jo who quilt I was pretty convinced that I didn’t have the skill level I needed. 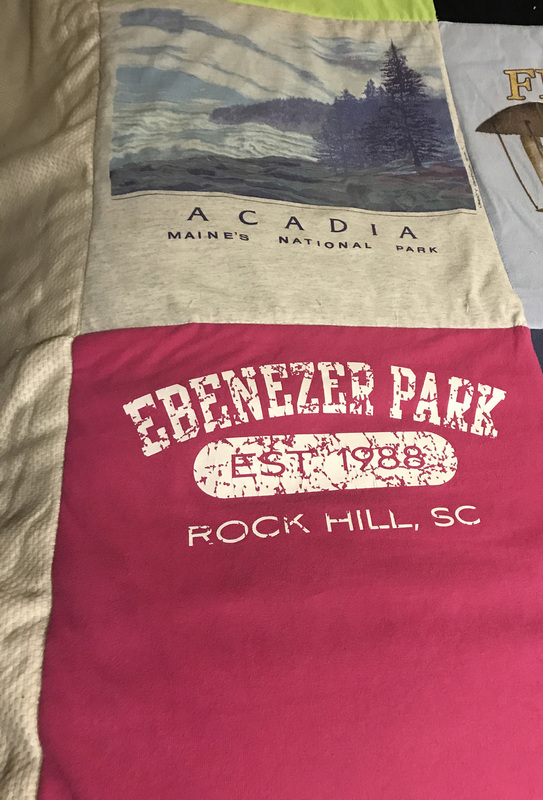 Then this year my sister had a T-Shirt quilt made for my niece who was going to college and I loved the look of it so much I called to get the information of the person who made it. Ruth from Polly Anna Picnic Quilts runs a small business from her home and to be clear I have no business relationship with her. I just really loved the experience and wanted to take some time to walk through how we got the finished product, which I love! Ruth is more than happy to just take a bunch of shirts and create a quilt, but we had something specific in mind and she was happy to accommodate us. I wanted the shirts to be in some sort of chronological order for our first year of travel, but the need to keep the shirts with the raised pictures at the bottom (didn’t want to feel rough stuff on my arms) and Lee’s need to have no two same colors next to each other (that’s just his aesthetic) made that a bit challenging. We selected the shirts and then spent a couple of hours laying them out on the bed and rearranging them, and when we finally got what we wanted I made a paper map to show what went where and we shipped them off. Shipping the shirts off, did give me pause because they mattered to me, but I felt very confident in Ruth. 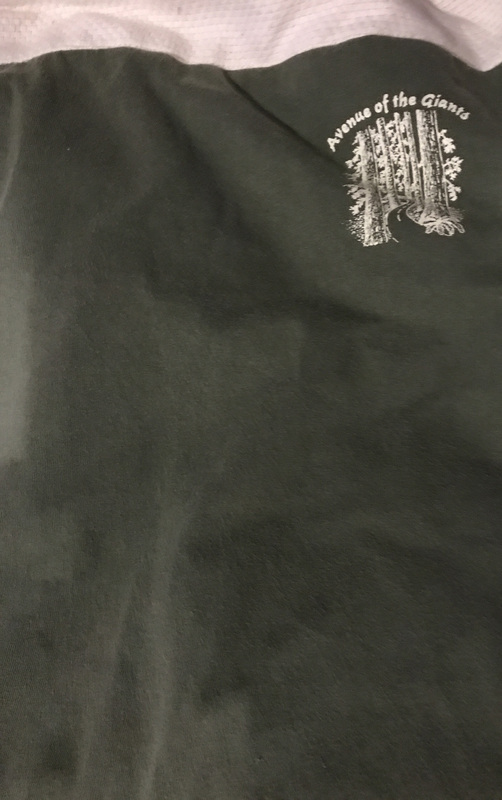 She took the shirts, laid them out, and then sent us a picture to verify. We also stayed in close contact about the material she was using for the outside edges and backing, and I had choices every step of the way, which was great. Finally the quilt was done and she shipped it to us, and our total cost was $200 which I felt was very reasonable, especially considering the amount of work involved. 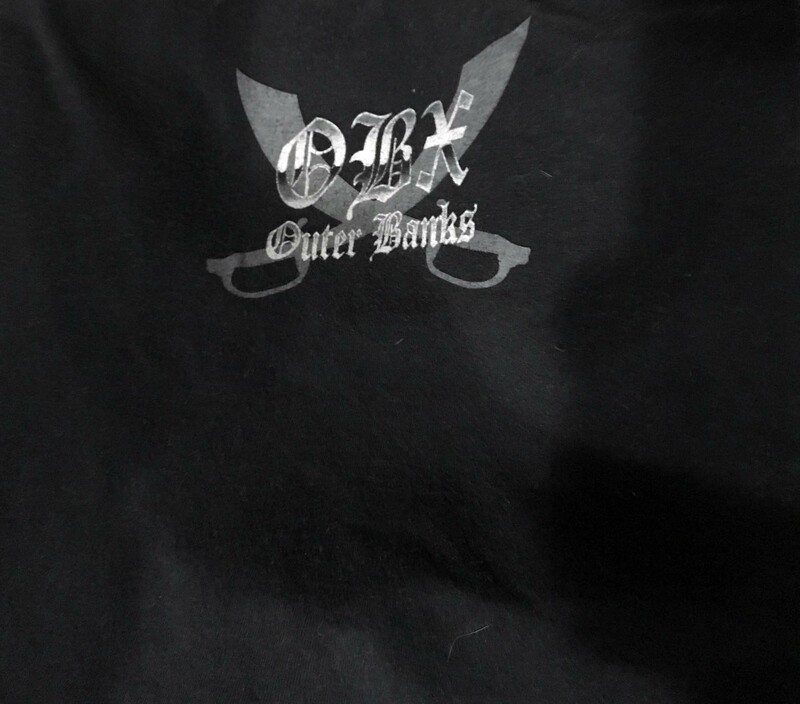 The price varies depending on size and quantity of shirts, so we were definitely on the high end with what we were looking for. The quilt is wonderful. It’s very warm (which we wanted) and the stitching is great. If you are interested in something like this and don’t have the time or skills I highly recommend checking out her Facebook page and getting in contact with her. 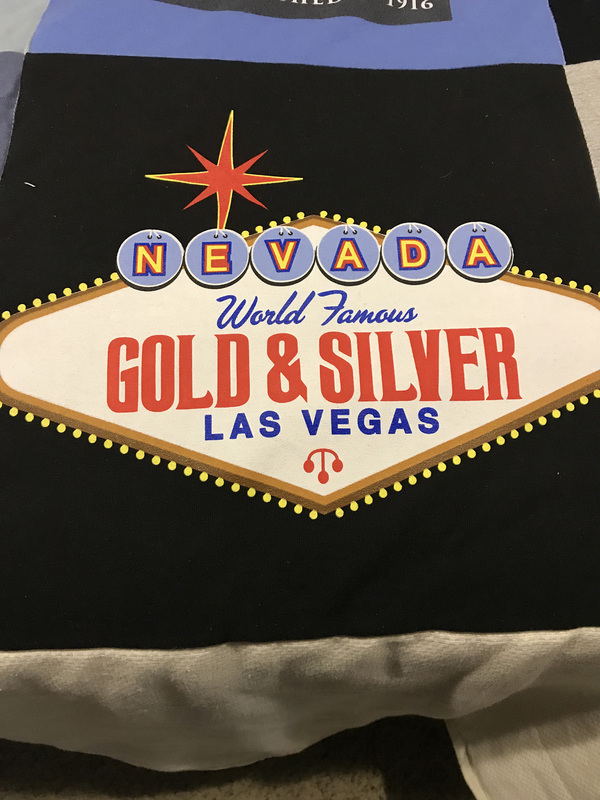 I had lots of really great memories and shirts to choose from, so I thought I would spend a minute explaining each one and the memory it evokes for me. If you are a long-time reader of the blog you will definitely get the references, and for those of you who are new, I’ll link back to some of the relevant posts. 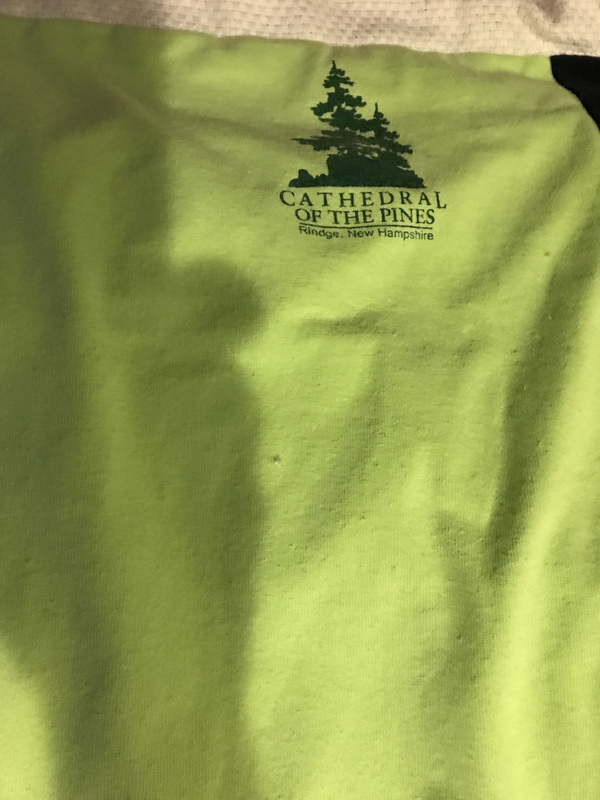 I started with Cathedral of the Pines because it was the first new local site we saw when we stayed in a seasonal site right becoming full timers. This place was less than 20 minutes from where we lived for 15 years, but we never took the time to visit it. That’s one of the best parts of RVing, the ability to slow down a bit, and look for the unique places you have never heard of before. Next we went to Acadia National Park with our friends Bryan and Susan, and again this was a place we had never been despite it being only about two hours from our house. We loved the park and the experience of camping with friends, and it was provided us with an idea of what our lives would look like. They were also the first non-family members we told about our plan to go full-time, and their support and interest gave us some much needed encouragement that we were on the right track. At the time we weren’t blogging about our plan, but you can read about the camping trip here. Ebenezer Park is still one of of our favorite campgrounds to this day, and has the added benefit of being very near my sister. We have gone back to this park several times, and the great staff and beauty never fails to delight. We have been lucky enough to stay here and experience Thanksgiving, Christmas, and an adoption party for my nephew and have always had a wonderful time. 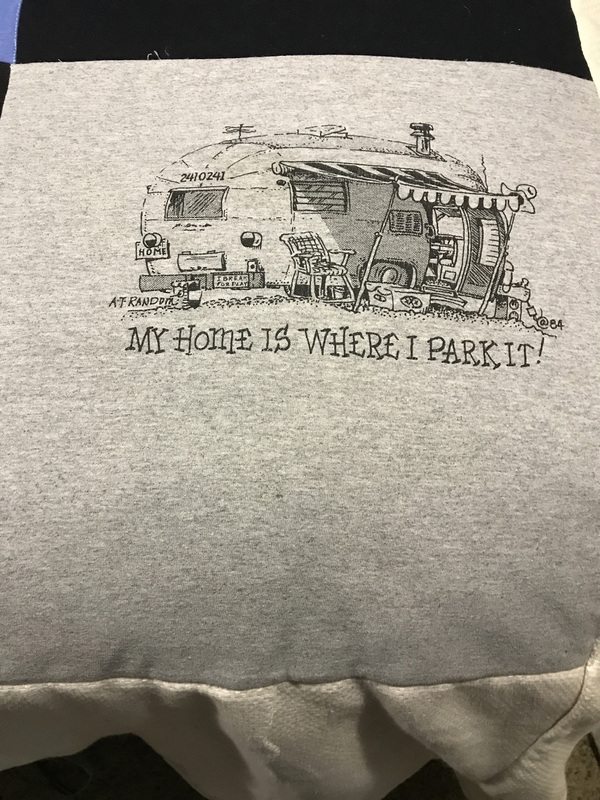 Plus the first time we were there we spent some time here with our RV friends Deb and Steve, and you can read about us as very new full timers in this post. While we were staying near my sister we took a two day trip to Charleston and fell in love with the city. We packed so many wonderful things into our days there and you can read about our first experience with the city here. My daughter actually lives there now with her new husband, and my mother is moving pretty close by, and I am excited we will have more opportunities to spend time in the city in the future. It was a bucket list item for me and definitely did not disappoint. After Charleston, we moved on in our rig and headed down to Florida, but first we stopped at Jekyll Island in Georgia. While there we went to the Georgia’s Sea Turtle Center and learned about the important work they do with the sea turtle’s in the area. I loved the center and the shirt more, and this may be my favorite T-Shirt I have bought in all our travels. It had to make the quilt, because it completely summed up what I wanted our new year to be about. Next up we went back to the top of the quilt and had OBX. After spending some time in Florida we headed up to the Outer Banks and spent a month with a group of RVing friends. We had no idea at the time how rare and special that opportunity would be and it solidified the bonds we had with people for many years to come. While we were in Outer Banks we had a very special day trip with our friends Kelly and Bill. We went to Kitty Hawk and as someone born in Ohio I definitely felt an affinity to the story of the Wright Brothers. Not only was the monument gorgeous, but it truly felt like hallowed ground, and walking along their original flight path gave me goosebumps. You can read about camping with a large group of people and the account of our special day trip here. 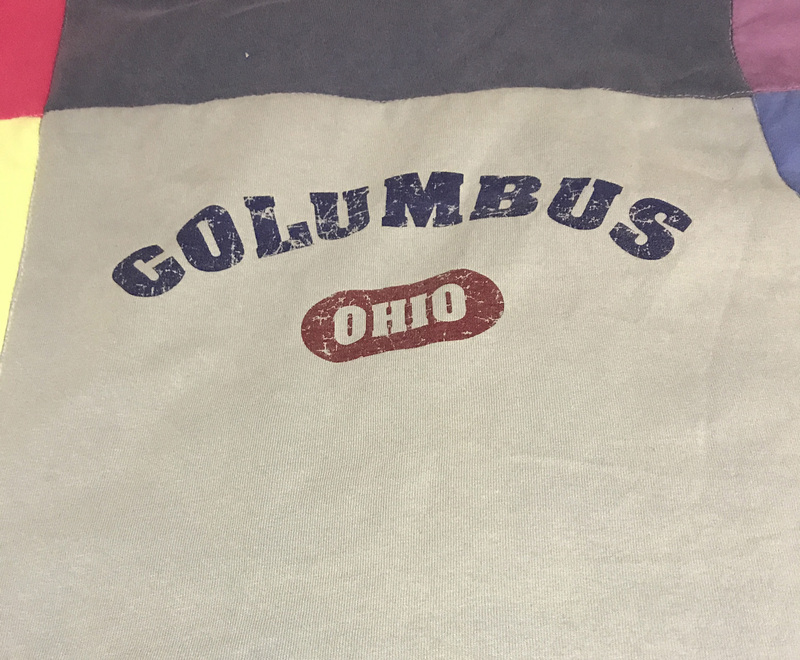 Our next shirt is for Columbus, and even though we grew up there (and technically could have had this shirt first…we talked about it), I chose to put it in the slot where we first stopped back in Columbus for an extended visit with our camper. 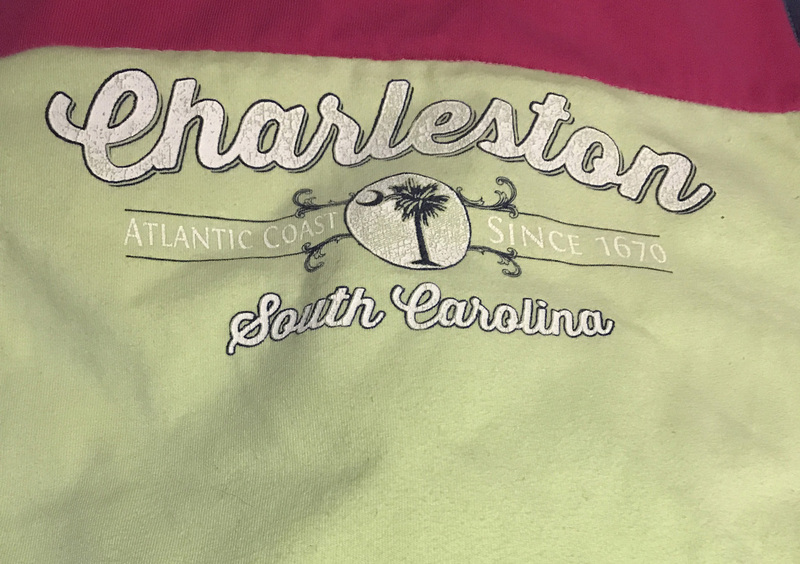 Again not 100% chronological, but we wanted to make sure our hometown was represented and Lee has had this shirt forever. I was kind of surprised he was willing to give it up. At the bottom of this row is my second favorite T-Shirt which I got while white water rafting at the reunion rally. This happened before Columbus and Voyageur but had a raised design so I definitely wanted it at the bottom. 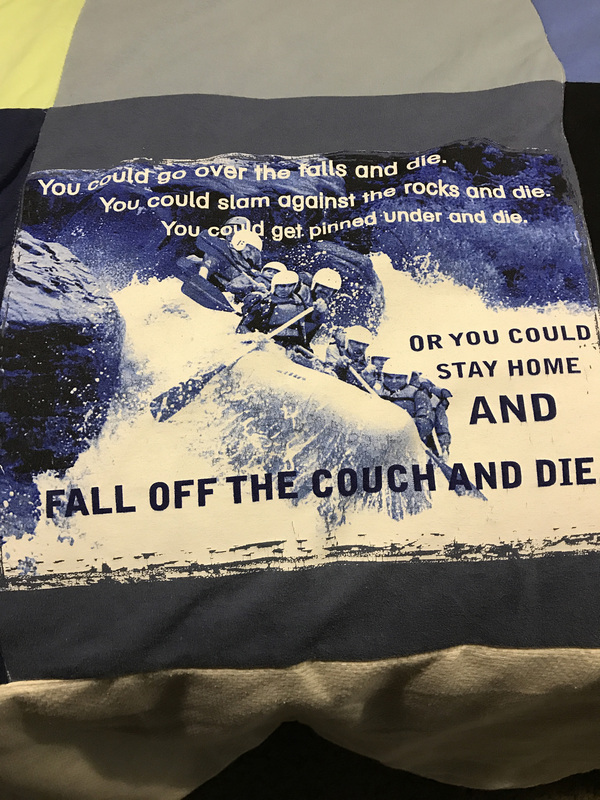 I love the sentiment, which talks about how you could fall off the couch and die, and since our entire journey started with my desire to get off the couch and do something it really spoke to me. It was hard giving this one up for the quilt because I wore it all the time, but I definitely wanted the sentiment to be expressed. This shirt was even on sale because our trip ran a little late and Howard negotiated a discount on purchases while we waited. He’s awesome at that sort of thing. Plus this was the trip where I helped save my friend Rick Raab’s life, and you can read about that little adventure here. With the next row we are back in chronological order and another one of my favorite shirts is represented. I love to go to diners and for my birthday we went to a very special one in Minnesota which was a combination bait shop and diner. I know that sounds kind of weird, but there was a glass wall between the two spaces and I adored the novelty of it. 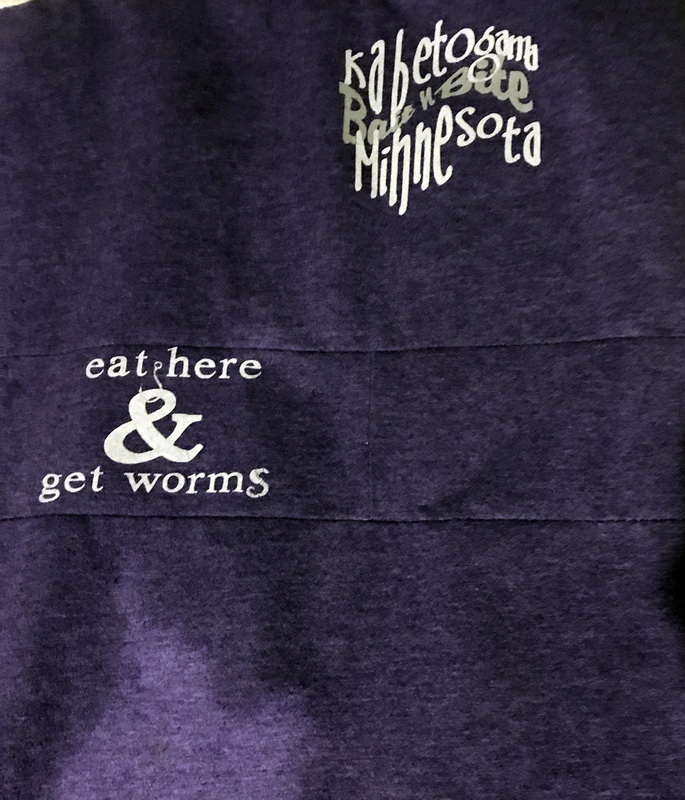 The T-Shirt sleeve had a cool slogan on the sleeve “Eat here and Get Worms” and Ruth took the sleeve portion and added it to the front of the T-Shirt for me. I wasn’t sure she could make that work, but she did a great job and those little touches are part of what makes this quilt so special. The Bait N Bite Diner in Kabetogama, Minnesota. Next up was Glacier National Park and that experience was so special it deserved two T-Shirts. We spent time with our friends Ellen/Mario and Deb/Steve and had an awesome encounter with grizzly bears, which is still to this day the most extraordinary thing that has happened to us on the road. 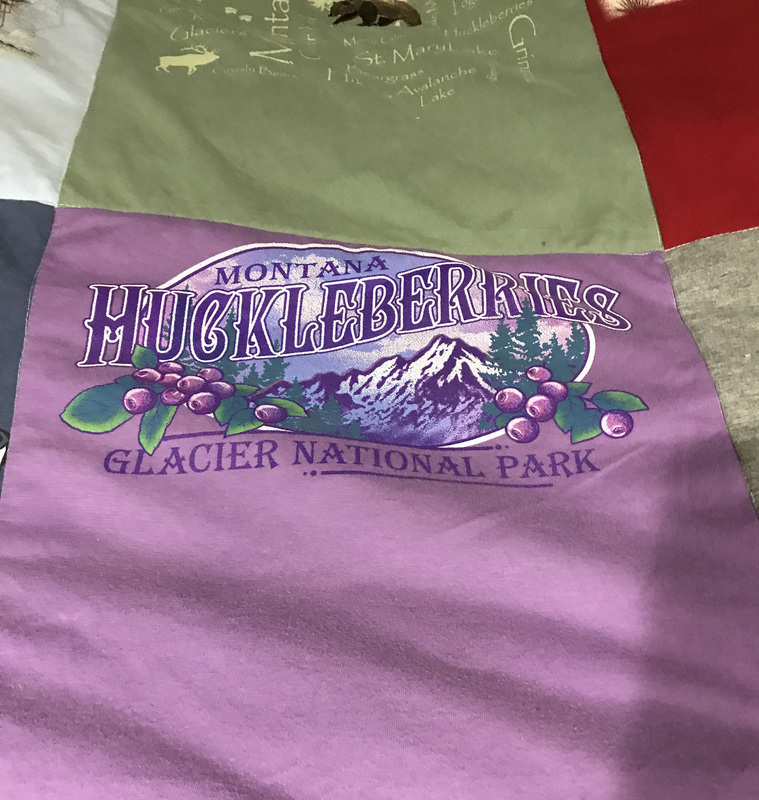 The second shirt paid tribute to Huckleberries, which Steve and I share a love for and it absolutely had to make the cut. 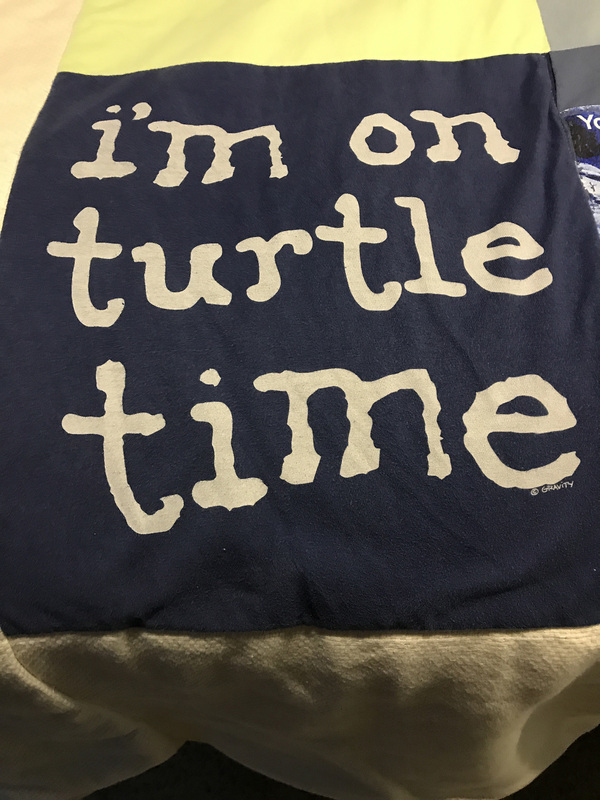 Whenever I see this shirt, I smile and think of Steve and Deb. Plus it’s very pretty and I was glad I added some purple to the quilt! Bear shirt above and Huckleberry shirt below. 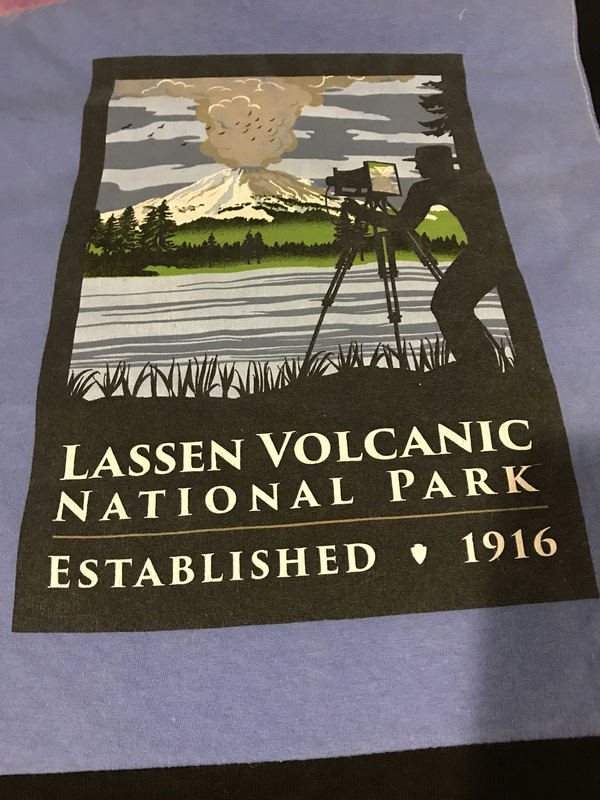 Next up is Lassen Volcanic Park which we visited while volunteering in Susanville, California. We had never heard of Lassen until our friends Howard and Linda recommended it and it definitely did not disappoint. I met my all time favorite rock there and had a wonderful time hanging out with it. And no that is not a misprint..I am a big fan of rocks and definitely had an affinity for this one. Plus we learned a very important lesson about National Parks. Sometimes the lesser known ones are actually better. Smaller crowds, for one thing, and the opportunity to explore a place you don’t know much about. This volcanic eruption was actually captured on film by a series of 6 photographs which was a complete fluke as no one knew it was going to erupt. That in and of itself made the park extremely interesting. Next up is Las Vegas and the Gold and Silver Pawn Shop. We have been to Vegas many times in our lives, but never in our RV, which was truly a different experience. For one we had access to our truck all week and I had more time to use it to explore. We really looked at Vegas as a town instead of just the strip, and I took the time to visit the place where Pawn Stars was filmed and as an added bonus got to touch an actual Patriots Superbowl ring. For me that was very special! The trip also drove home the point that we are not on vacation, and was a mental turning point for both of us. It is one thing to explore new places, but going back to a vacation spot in our new circumstances definitely had an impact on both of us and I wrote about it in this blog post. Finally the last row, and if you are still hanging in with me, thanks for that. I know this is a weird recap post, but I wanted to capture the meaning in the quilt for me own future benefit if nothing else. We were forced to jump out of order again (wow we did that more than I thought, but hey, my quilt my rules) and the next square is from the Redwoods. This was the first time we volunteered and our first visit to the Redwoods and a bucket list item of mine since I was a little kid. Visiting the redwood groves was a truly spiritual experience, and living for a month inside of one was a once in a lifetime experience. That being said, it also rained for 10 straight days while we were there and we learned quite a bit about ourselves and what we could tolerate in weather while staying there. Lee loves this one because you can see the stains on the shirt. I wore this one a lot! 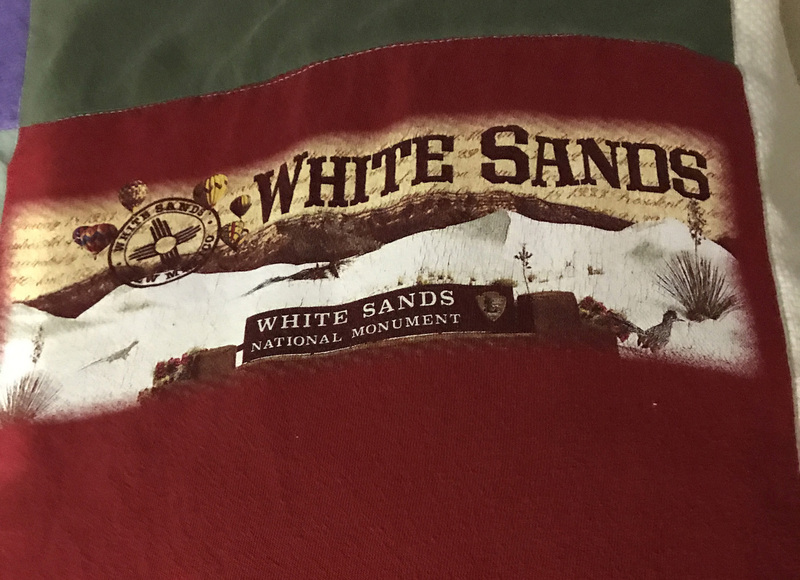 White Sands National Monument was a long time bucket list item of Lee’s. Getting to experience it with our friends Cori and Greg and their puppy Hobie made it even more special. Traveling through Canada to get to Alaska was an epic experience in and of itself. We experienced many firsts, but my favorite was the day we saw so many different animals, including lots and lots of bears. 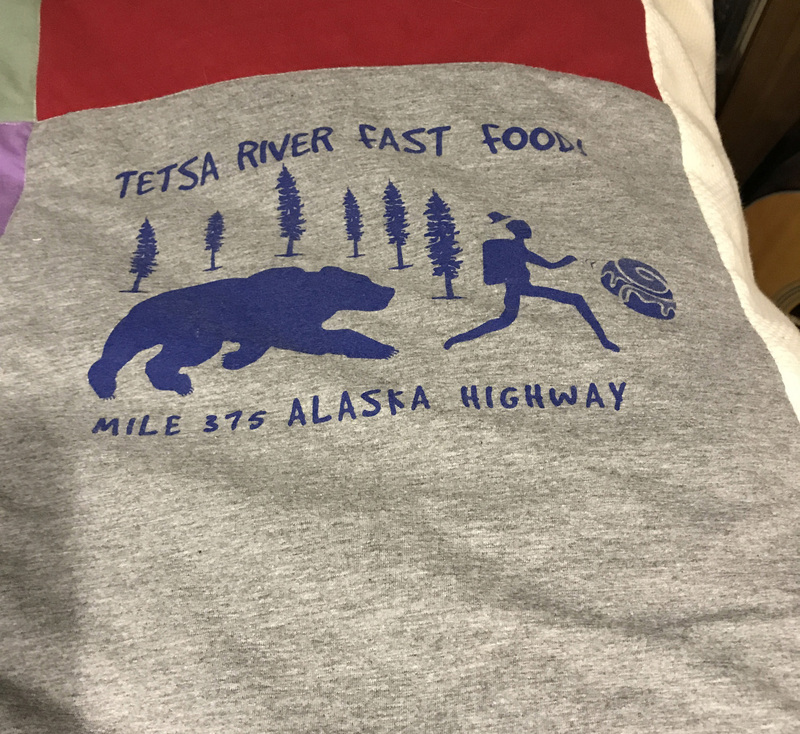 I picked this T-Shirt to represent that trip, mainly because I loved the campground along this river and it made me laugh. You can read about our seeing 7 different mammals in the wild in one day here. We saw so many amazing things in Alaska it was hard to pick one shirt to sum up the adventure. Ultimately I chose this one because this little known national park was very close to where we stayed for the summer and we spent the 100th anniversary of the parks service there. It also includes a glacier at the top and the copper mine at the bottom, so seemed like the perfect choice. 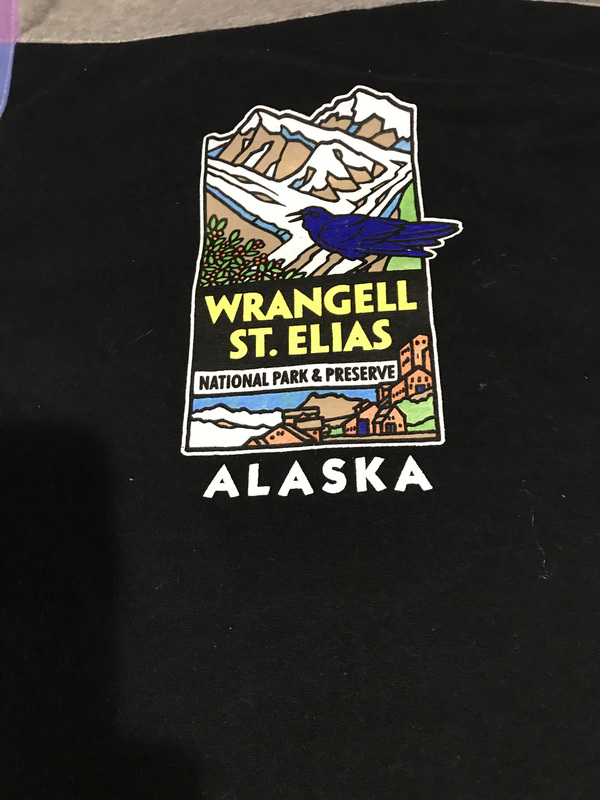 And since it was my least favorite T-shirt to wear from Alaska (it just wasn’t that comfortable and I rarely wear black anymore), it was the easiest to give up for the cause! You can read about our visit to the copper mine, which is inside the park, here. And finally, I had to find a way to end the quilt. It needed to say our journey wasn’t over with the Alaska shirt, and also sum up our experiences to date. Quite a tall order for a T-Shirt! So I selected my very favorite shirt to end the quilt, which I think tied everything together nicely. To be honest I am not sure if I could have done this if I didn’t have a hole in the shirt, but it worked out great and gave it a purpose past the point I could wear it. This whole thing may seem silly to some of you..and I totally get that, but I am a sentimental person and this quilt is a representation of that. So once again I want to thank Ruth from Polly Anna Picnic Quilts who made this possible, and recommend if you are looking to do something similar and don’t have the skill set you reach out to her. Thanks for following along and I hope you enjoyed reading about this as much as I enjoyed writing about it. 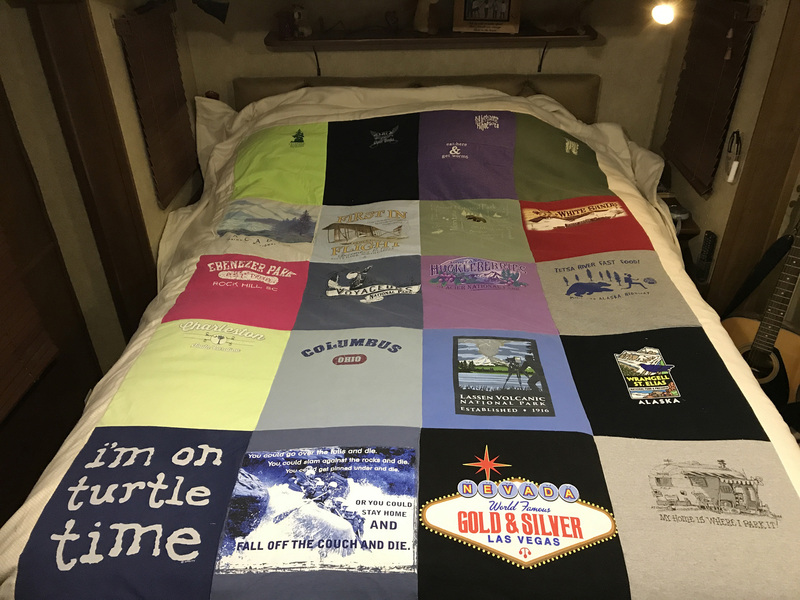 This entry was posted in Lakeside and tagged Polly Anna Picnic Quilts, RV Travel quilt. Bookmark the permalink. Wonderful quilt! What a treasure! I know your room in the RV is limited but this really should be on a wall, rather than used on the bed. Because there is no stitching to hold the batting flat, if it needs to be laundered, I don’t think you will be happy with the results. The batting gets “bunchy”. Maybe the lady who did the quilt has some suggestions or has stabilized the batting in a way that isn’t visible from the front. Just an FYI from an old home ec teacher! Ruth, your quilt is made so well! What do you suggest is the best way to keep it clean if it is in daily use? Absolutely if we are back in Oregon we are there!! LOVE LOVE LOVE IT! It’s even better in person! I may have to steal this idea some day!